Trying this out. I may or may not move from Goodreads. 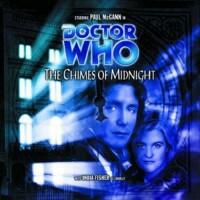 Chimes of Midnight is one of the best Big Finish audios I've listened to thus far. I enjoyed the way Shearman took the cozy mystery trope and turned it on its head. *I truly enjoyed Charley in this audio. Though I'd heard a couple of the Eight/Charley audios previously, I was never attached to Charley as a companion until now. *Chimes of Midnight has tons of atmosphere. Though the story is set around Christmastime, it has a 'Halloween' sensibility. *Repetitive language. Shearman obviously intended to illustrate the existence of the Time Loop by repeating phrases ("Christmas wouldn't be Christmas without your plum pudding!"). But after hearing the same phrase for the tenth time, the tactic began to wear on me. That being said, I strongly recommend The Chimes of Midnight to any Who fan who loves a good mystery.